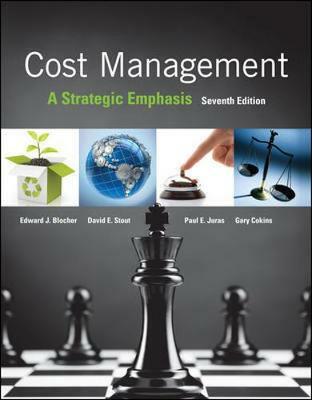 Cost Management: A Strategic Emphasis, by Blocher/Stout/Juras/Cokins is dedicated to answering the question: Why Cost Management? Blocher et al. provide the cost-management tools and techniques needed to support an organisation's competitiveness, improve its performance, and help the organisation accomplish its strategy. The text is written to help students understand the broader role of cost accounting in helping an organisation succeed - and not just the measurement of costs. While the text does include coverage of traditional costing topics (e.g., job-order costing, process costing, service-department cost allocations, and accounting for joint and by-products), its primary strength is the linkage of these topics, as well as more contemporary topics, to an organisation's strategy. This message is reinforced by a dynamic author team, all four of whom have close ties to current cost management practice. New to the 7th edition is McGraw-Hill Connect, a digital teaching and learning platform forhomework completion and review that helps improve student performance over avariety of critical outcomes while aiding instructor grading and assessmentefficiency. Housed within Connect, SmartBook is an adaptivestudy tool that helps identify specific topics and learning objectivesindividual students need to study. As students read, SmartBook assesscomprehension and dynamically highlights where they need to focus more. Theresult is that students are more engaged with course content, can betterprioritize their time, and come to class ready to participate.